5. VaraVara Rao, noted poet and rights activist. PUCL also denounces the simultaneous multi-city raids conducted today, 28th August 2018 in a concerted and pre-meditated manner across the country at the premises of other eminent human rights activists. 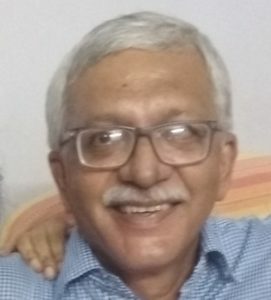 Activist Vernon Gonsalves returned home on Thursday morning after a 48-hour ordeal that started at 6 a.m. on Tuesday, when his house was raided by the Pune police. 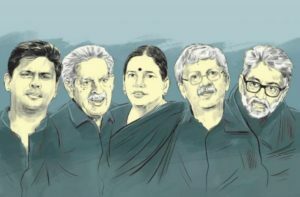 Mr Gonsalves and four other activists were arrested under the various sections of the IPC and the draconian Unlawful Activities Prevention Act (UAPA). The Supreme Court on Wednesday directed that the five be placed under house arrest until September 6. On the morning of August 28 just as the people of Ranchi city were waking up to a clear sky after heavy downpours in the previous days, and preparing themselves for the day’s chores, they were taken aback by the abrupt raid on the home of Father Stan Swamy, a Jesuit Priest and one of the city’s most prominent social and political activists. Courts in five different places, including Delhi High Court, Faridabad court, Pune sessions court, Punjab and Haryana High Court and the Supreme Court, have addressed the police’s recent targeting of lawyers, activists and writers, in connection with the Bhima Koregaon violence in petitions filed by concerned members of the academic fraternity. Minal Gadling, the wife of advocate Surendra Gadling, on behalf of the five activists arrested on June 6, 2018 — including her husband Gadling, Professor Shoma Sen, Sudhir Dhawale, Mahesh Raut and Rona Wilson — has approached the Supreme Court seeking intervention in a petition filed by Romila Thapar and others. She has prayed for extending the benefit of Supreme Court’s order passed on August 29, 2018 in Romila Thapar case to all the above-named persons who are under arrest since last two months. We, the undersigned, strongly oppose and condemn the illegal raids carried out in different cities, and arrests of Gautam Navlakha, Sudha Bharadwaj, Arun Ferreira, Vernon Gonsalves and Varavara Rao by the Maharashtra Police on 28 th August 2018. These are only the most recent arrests in a continuing wave of repression spearheaded by the police at the behest of their political leaders and their communal and casteist agendas against people’s movements and human rights defenders. The targeting of these democratic rights activists and organizations is anattack on the poor and marginalized sections of our society on whose behalf these activists have been raising their voices. His counsel alleged that the Telangana Police were not permitting his lawyers to meet him.